SPAA05 RAMIS (Real-Time Antenna Measurement Input Software) is the standard PDA measurement software for all our SPAA05 tools. It features standard 100-count measurement functionality along with database interaction. 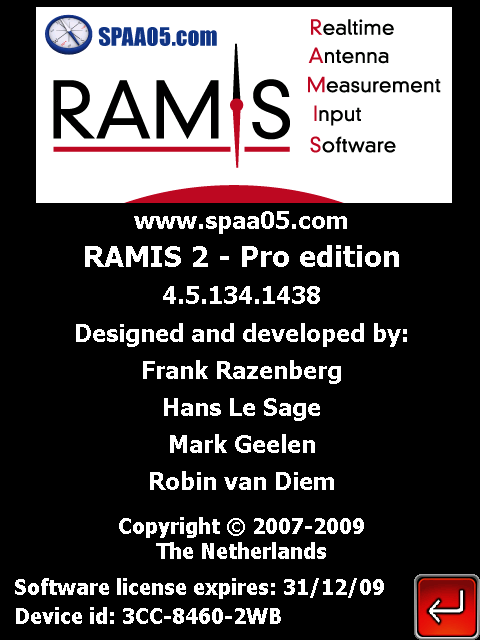 RAMIS comes in three versions: the Lite, Full and Pro. The Lite version can be downloaded for free (see Download). The Full is delivered with every purchase of a SPAA05 tool and the Pro can be purchased from any of our distributors.